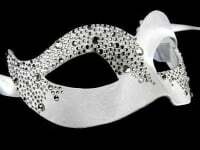 A genuine Venetian black filigree mask - instantly complete your masquerade ball outfit with this beautiful party statement with Swarovski crystal detailing. This mask comes in a petite fitting and can be adjusted to fit around your head using the black, co-ordinating satin ties for comfort. The filigree style is easy to wear: it is extremely light and won’t become uncomfortable as you party away at your masked ball, Mardi Gras or Venetian Carnival themed special occasion. Why do customers choose genuine Venetian? What makes them stand out? Quality of materials and craftsmanship make a visible difference. But it’s more than that. When people buy a mask from us, it is because they are looking for more than just a costume accessory. They want a signature piece, a statement to represent the character they have chosen to be for the evening. They also buy a piece of Venetian history. The masquerade mask is part of Venetian culture, made by the City’s craftsmen keeping alive an ancient tradition. The first masks were made in Venice in the 12th century and, at that time, were designed to be worn for practical reasons. In the overcrowded city alleyways, privacy was impossible and many people sought freedom from the strict controls imposed by Venetian society. The mask was a way of temporarily concealing their identities so they could move about the city without restrictions. Masks soon became a Carnival icon and by the 17th century, the masquerade costume represented Il Carnevale, Venice’s big annual festival and the highlight in the City’s social calendar. It remained so until the late 1700s when the republic fell to Napoleon and Venice passed into Austrian control. The Carnival was over, seemingly forever, until the Spring of 1979 when it was held once more. Since the 1980s the Carnival di Venezia has become an annual festival again, celebrated the world over and becoming ever more extravagant each year. Why not create your own Venetian Carnival inspired event, or just wear the beautiful Papette and enjoy your own little piece of Venice? Post and packing is free within the UK - order your mask today for fast delivery.